Sri Ram and Parshuram once met at Panchavadi during Sri Ram’s exile period. Sri Ram was watering plants in the forest when Parashuram arrived. During their talk, Sri Ram inquired what Parshuram was doing. Parashuram said that he was clearing the forests in the neighbouring region and building ashrams and villages. On hearing it, Sri Ram just smiled. The smile and eye contact conveyed a very important message to Parashuram. Parashuram then bid adieu to Sri Ram. While returning home, Parashuram met a few learned people. He told them that Sri Ram taught him a very important lesson today. The learned people wanted to know what the lesson was. He said that he cleared forests and built villages and ashrams. But Sri Ram was watering and nurturing plants in the forest. If people follow, my path there will be no forests in future. If there are no forests, there will be no people. The existence of human beings is directly related to the existence of forests. All people need to follow the path of Sri Ram for future generation. It is said that Parashuram after this incident never cut trees or cleared forests. This episode is famous in Ramayan related stories in South India, especially in Kerala. What is important that ancient people had recognized the importance of forests. 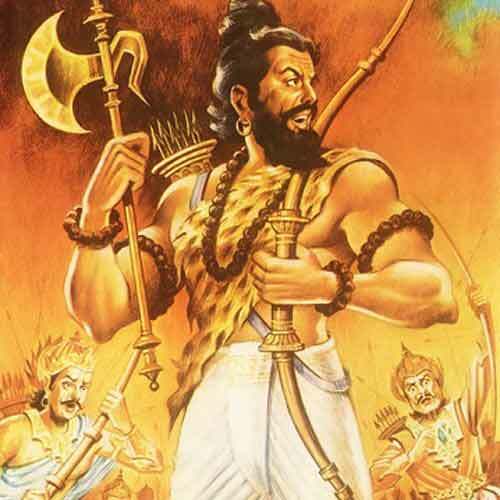 The generation of Parashuram must have cleared forests for villages and farmlands. The next generation, which was of Shri Ram, might have realized the problems created by deforestation. So they immediately propagated afforestation for future generation. But, what are learned sophisticated modern humans gifting the future generation?